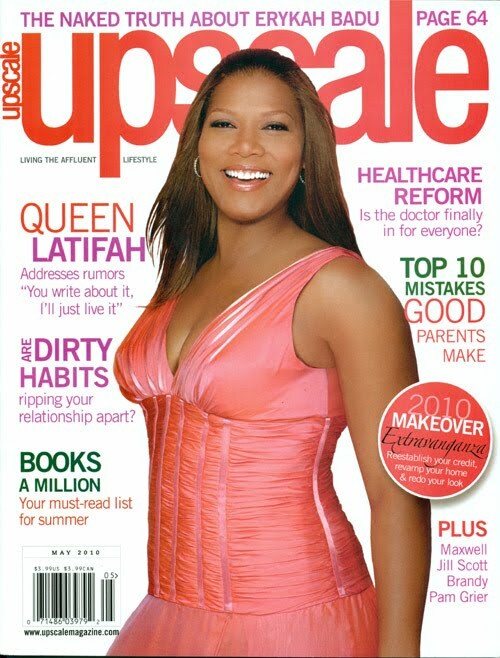 Queen Latifah is the May/June cover girl for Upscale magazine. The queen looks radiant on the cover in a form fitting frock. Latifah has never been one to shy away from telling it like it is. She is one of those celebrities whose business is not all out in the street (except for those stripper pictures). She has managed to have a strong career for the past 20 years. In the issue Latifah discusses her thoughts and feelings about social networking. My Thoughts:I have to agree with her last statement. Today with Twitter, Facebook, and, Myspace there is a lack of connection with people. I remember back in the day when emailing was the biggest way to communicate with people. When texting came, oh, you could forget it. I hated to even pick up the phone and talk to anyone. I would say just text me. Sometimes, I do just long for that personal time with a friend or family member. I miss the face to face with people. Being able to see their expressions while they talk about their day or what’s going on in their lives. I’ve always found that whenever you email or text a person, you can never be too sure of the tone of the email or text. I have gotten into plenty of disagreements because someone misread what I wrote. I say that to say this (lol). Every once in awhile take a moment to pick up the phone and talk or schedule a time to meet with that friend you have been rain checking for almost a month now.